Quite confusing title, considering that Rafiji was a known teetotaler. However, the innumerable Sharabi Songs which Rafiji has sung does not indicate this fact. Without drinking a pint, Rafiji could blabber and drag words like a real Sharabi. Some of the well-known such songs of Rafiji are listed below. â€œKabhi Na Kabhiâ€ and slower version of â€œSawan Ke Mahine Meâ€ from SHARABI and â€œHum Bekhudi Me Tumkoâ€ from KALA PAANI picturised on Dev Anand. It seems SDB was very highly impressed with the singing of Rafiji for Kala Paani. In fact, the super song of GUIDE â€“ â€œDin Dhal Jaayeâ€ also had Dev Anand singing with a bottle in his hand and listen to Rafiji singing the whole song almost in the same pitch but clearly maintaining the melody and quality of the song. No wonder, SDB bluntly told KK and Dev Anand that KK could not have justified the three solo songs of GUIDE. â€œMuzhe Duniyawalonâ€ from LEADER and â€œPeete Peeteâ€ with Asha from BAIRAAG both picturised on Dilip Saab. It was a treat to watch these two songs with Dilip and Jayant (in the LEADER song) expressing with their eyes. â€œMaine Peena Seekha Liyaâ€ from GOONJ UTHI SHAHANAYEE, â€œPeekar Sharab Khelungaâ€ from GANWAAR and â€œChalke Teri Aankhon Seâ€ from AARZOO were on Rajendra Kumar. The first and the third song became hits though the second song had for a change, some western music by Naushad. â€œHai Duniya Usikiâ€ from KASHMIR KI KALI for Shammi Kapoor and OPN as MD. The song had many twists and turns, high and low pitch singing and Rafiji came out triumph in his inimitable style. â€œChalka Yeh Jaamâ€ from MERE HUMDUM MERE DOST on Dharmendra was another hit song. Shashi Kapoor sang â€œPeelo Aaj Peeloâ€ from PATANGA and â€œSone Deti Hai Naâ€ in NAINA. â€œMain Sharabi Nahinâ€ with Asha from KHILONA was a dream song on Jeetendra and Mumtaz. â€œJo Unki Tamanna Haiâ€ from INTAQAM was a melodious song which Sanjay sang on screen. â€œMaine Pee Sharabâ€ from NAYA RAASTA had Balraj Sahni singing on screen. â€œYeh Kooche Yeh Neelamâ€ and â€œGum Is Qadar Badeâ€ from PYAASA were beautifully picturised on Guru Dutt. The former had very good lyrics by Sahir Ludhyanavi and the latter was more or less like a couplet. â€œYeh Zulf Agar Khulkeâ€ and â€œChoolenedo Nazuk Hoton Koâ€ from KAZAL and â€œAaj Is Darja Piladoâ€ from VAASNA were on Jaani Raaj Kumar, who was well known for his drunken roles. Incidentally Raaj Kumar was one actor who remained steadfast in using Rafiji as his playback singer even during seventies. Bharat Bhushan, another Rafijiâ€™s actor, sang â€œMehfilse Utth Jaanewaloâ€ in DOOJ KA CHAND. Deepak Kumar was lucky to get a wonderful solo â€œYeh Zindagi Haiâ€ in AABROO. The above songs added life to the acting of great actors like Dilip Kumar, Raaj Kumar, Rajendra Kumar, Guru Dutt, Dev Anand, Shashi Kapoor, etc. Some of the words like â€œsharabiâ€, â€œkhumarâ€, â€œmaikhanaâ€, â€œpyaasâ€, â€œpiladoâ€, â€œzaamâ€, â€œsharabâ€, â€œpee gayaâ€, â€œnashaâ€, â€œpyaalaâ€, etc. in the above songs were sung by Rafi Saab as if a real drunkard is singing the same. 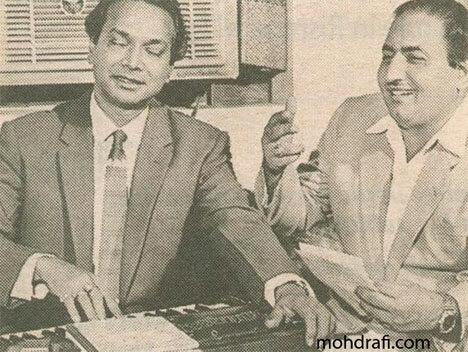 Rafiji had a special quality of blabbering and dragging words while singing these Sharabi songs. The laughter while singing the songs of GANWAR and GOONJ UTHI SHEHANAI were so real. Very few songs of other Singers can be clubbed with the above songs in terms of quality like Mukeshjiâ€™s â€œZindagi Khwab Haiâ€ from JAGTE RAHO and the Title song of MAI NASHE ME HUN, Latajiâ€™s â€œSharabi Sharabiâ€ from CHANDAN KA PALNA, â€œHaanji Haan Maine Sharab Pee Haiâ€ from SEETA AUR GEETA and â€œKaise Rahun Chupke Maineâ€ from INTAQAM, Ashajiâ€™s â€œSheeshese Peeâ€ from PHOOL AUR PATHAR and Mannadaâ€™s â€œAbhi To Haath Me Jaam Haiâ€ from SEETA AUR GEETA. This entry was posted on Friday, January 18th, 2008 at 8:40 pm	and is filed under Meri Awaaz Suno. You can follow any responses to this entry through the RSS 2.0 feed. You can leave a response, or trackback from your own site. another song “arey re re sambhalo mujhe yaaro maine nahin pee ye pyaar ka nasha hai…film Khuda Kasam. Another song which comes to mind is ‘Dekhta Chala Gaya Main Zindagi rahon Mein’ – a duet with Lataji from the film ‘Gateway to India’ in which Rafi Sahab playbacks for Johnny Walker. Its based on western chords and is simply wonderful. film “do gunde ” ka ye git “mai nashe me hu” picturesed on ajit is also a lovely song. are meri nazar se dekho zamana nashe me hai– MD Nachiketa. To tell and to do both are quite different. 1) ” GULABI GULABI ANKHON SE PILA DE ….. FILM :’ BANPHOOL ‘. Hai Rafians, I would like to add few more songs on this topic. 11) Saaghar nahi to kiya, teri aankh ka nasha to hai – Natak- MD- LP. This is rare diamond and my favourite number of Rafi Saheb. The list can go on. We hear Rafi’songs with new standard of understanding. he was a superlative genius. Good article. But all Rafi lovers should be focused on bharat ratna issue at this time. Competent people(people knows the process of rewarding bharat ratna award) on this site should advise the Rafians if there is any thing that rafian’s can do to achieve mohd. rafi bharat ratna. Music expert may write in the news paper very specific points why rafi should be awarded bharat ratna. I AM REMINDING ANOTHER ” SHARABI SONG ” OF RAFI SAHAB . THE SONG IS ” MAIN WOHI … NAYA DIN NAYEE RAAT ” FROM THE FILM ‘ NAYA DIN NAYEE RAAT ‘ . THE MUSIC IS BY LAXMIKANT PYARELAL . Nice article, Rafiji have sung on Sanjeeve Kuram’s song “Khudtu Badnam Huya Humku badnam Kia” with Aisha Bhossily Film Chanda Aur Bijli” composed by Shanker Jaikishan another song on Rajkumar “Kistarah jeetey Hei” Film Nai Roshni” are superb all songs expressing the situation and heart feelings of actor. Rafiji have completed all dimentions easily in each antra no one can reach upto his style with melodious voice. Many many thanks for this article touching our hearts. Thanks a lot for your clarification to update my database. i would like to add another sharabi number by Rafi Saheb, “Jungle Mein Moor Nacha Kisine Na Dekha, Humne Todi Si Peke Jhooma Sabne Dekha” from Madhumati composed by S-C and picturised on great comedian Jhoney Walker. THE SONG FROM ” SAAS BHI KABHI BAHU THI ” IS NOT SUNG BY RAFI SAHAB . IT IS SUNG BY KISHORE KUMARJI. I AM ADDING ANOTHER SONG OF RAFI SAHAB OF THIS CATEGORY : ” MAIN KAUN HOON , MAIN KAHAN HOON , MUJHE YE HOSH NAHIN ” … FROM THE FILM : ‘ MAIN CHUP RAHUNGI ‘ . THE MUSIC DIRECTION OF THIS SONG IS DONE BY CHITRAGUPTA . if the title of the article like “Sharabi numbers by Rafi Saheb” or “Rafi Saheb sang the sharabi numbers” is more suitable/sobar than “Sharabi Rafi”. the song ” Ao Piyoo Pineka Zamana Aaya” is not from Jawab it was from Jetendra-Mumtaz starred Himmat, which was remake in early 1990s as “Aag Ka Gola” with Sunny and Dimple. I would also like to add another soulful sharabi number by Rafi Saheb “Nasseb Mein Jiske Jo Likha Tha Woh Tere Mehfil Mein Kaam Aaya Kise Ke Hise Mein Jaam Aaya Kisike Hise Mein Pyass Aaya” from Do Badan picturised on Bharat Kumar (Manoj), who is not a regular Rafi Hero. Dear Guru Murty Ji a great n great article. Rafi Saheb was devoted Muslim and refrained from drinking and smoking. But he sung all the Sharabi numbers very soulfully and nicely. picturised on Jeetendra and Aruna Irani. thanks for ur great job sir.awards given to human and Mohd Rafi is angels.Mohd rafi got fans like u and many more it is itself more better than Bharat Ratna award………………………. We are getting our priorities wrong it seems . Mr. H.V. 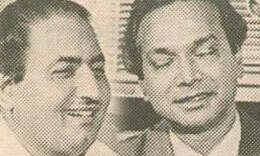 Guru Murthy has presented a wonderful article about Rafi Sahib, Many Many thanks. I salute your ocean of knowledge about the melodious Rafi. Rafi sahib had the a power to hypnotise the audience through his inimitable voice & fantastic style. No other singer reached/reaches even to the dust of his feet. Rafi Sahib is a true heritage of India, Asia even of the whole universe. I thank whole-heartedly to Mr. Binu Nair, Mr. P.K. Narayanan, Mr. Anmol Singh, Mr. Ashish Kapoor, Mr. Zorawar Singh, Mr. Mohd. Parvez, Mr. Mohan Flora, Mr. H.V. Guru Murthy who are still dedicating their valuable time to Rafi Sahib, even after 28 years of his demise.